In 2015, Jeremy Gabrysch returned from Ethiopia after 4 years of working there as a missionary doctor. During that time he learned healthcare could be handled with fewer resources. His vision: to create a company that would move medicine forward while making care more accessible. He wanted to bring the house call back. 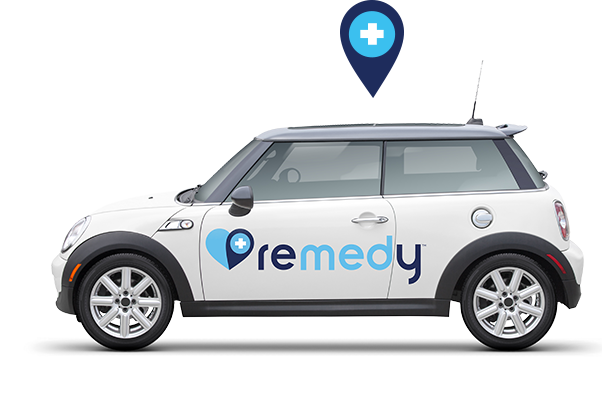 Remedy delivers the service, expertise and technology of an urgent care clinic directly to you. To be successful, we needed to reshape people’s expectations of urgent care and we needed to earn their trust. We named it Remedy to convey the sentiment of "doctor in your home" in a warm and familiar way. The logo expressed mobile medicine with a "pin" incorporated into the heart icon and highlighting "med" in Remedy. We also created a modern design aesthetic with friendly, informative illustrations and bright colors, appropriate for a new take on medicine. Remedy now had the brand to legitimize them as a doctor in your home. But changing people's expectations for how to receive urgent care was a tall task. To help do this, we created an animated video explaining how Remedy worked. We also designed an app that made it easy to call a doctor to your door. We combined traditional and digital advertising elements to build a strategic media plan targeted primarily to moms, knowing they are often the primary decision makers in their families' healthcare needs. Hoping to reach moms with multiple touch-points throughout their day, we ran a combination of traffic sponsorships and billboards for their drive to and from work or school, programmatic digital buys, mommy blog sponsorships and social media campaigns as they're perusing the web, and geo-targeted national magazines like People, Real Simple and Cooking Light to reach them during downtime and family planning time. The goal was to be seen as a trusted brand who understands the hectic lives of moms and the need for convenience in all aspects of their lives, including the often un-planned healthcare needs of the family. Remedy sends a doctor for physicals, treating illness, taking labs, to even getting stitches! With a commitment to brand consistency, targeted messaging, and tireless efforts to make this care more accessible, Remedy house visits have doubled year over year. People are beginning to trust Remedy as their in-home urgent care provider. Just two years in to pioneering a new frontier of in-home urgent care, Remedy has now treated over ten thousand patients.